John Dixon took a bunch of us on a pleasant amble here via the Fair Oak Circle site. From Fair Oak, go round the back of the farm and past the small cluster of hidden cottages, then bear right down the dirt-track and up the slope, then cross the field in front of you, going over the stile, following the footpath round the eastern edge of the slightly limestone New Laund Hill, and down again, thru the gate. From here, head diagonally across the field 150 yards towards the fencing at the woodland edge. Over the fence, into the trees, head halfway down the steep-ish slope and keep your eyes peeled for the rocky outcrop nearly halfway down. Alternatively, an easier way here is apparently from the Inn at Whitewell. Go across the river via the stepping stones (or wade!) and follow the footpath uphill towards a farm, where you’ll find a large steel gate on the left that leads into the woods. Here there are 2 paths: follow the higher of the two until it starts bearing to the right. Once here, look up the hill to the right you’ll see the rock outcrop. The caves are there! “In 1946, an excavation was carried out on the site by the archaeologist Reginald C. Musson. 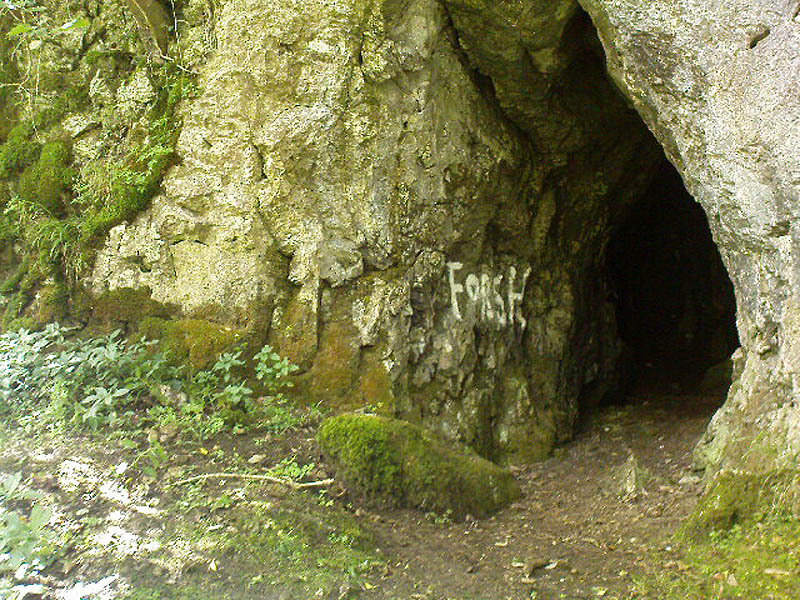 In front of the larger cave is a flat platform on which evidence of Bronze Age daily life was found. This included animal bones, a pebble pounder (used to extract marrow from bones) and shards of a food vessel. Dixon, John, The Forest of Bowland, Aussteiger Publications: Clitheroe 2004. This entry was posted in Brigantia (Northern England), Lancashire, Sacred Nature and tagged antiquarian, antiquities, Archaeology, Bronze Age, burials, cavemen, caves, death rites, earth mysteries, english heritage, faerie, fairies, Forest of Bowland, Lancashire, little people, magick, mesolithic, neolithic, prehistoric sites, ritual sites, sacred sites, shamanism, speleology, spirits, underworld, Whitewell. Bookmark the permalink. Also found during the 1946 excavation were fragments of flint and large lumps of bronze slag, the later being the waste product of from smelting providing evidence of metal working on the site. The majority of the limestone outcrop at Fairy Holes is covered in landslip and more caves and the evidence of early man await discovery. The project will investigate the evidence for human activity in prehistory preserved in caves, rock-shelters and swallow-holes in the Forest of Bowland Area of Outstanding Natural Beauty. The particular area of interest is evidence for later prehistoric (Mesolithic- Iron Age) mortuary ritual in caves and rockshelters. The limestone geology of the area is restricted to a number of small reefs on the south-east side of the AONB. The intention is to map, record and sample all the potential sites within three study areas within the limestone reefs. These study areas will be centred upon Whitewell, Slaidburn and Gisburn Forest. Preliminary research has already begun on the Whitewell study area with the co-operation of Mr John Alpe of New Laund Farm and the intention is to spend three field seasons exploring and characterising the archaeological remains in this area. Site visits, inspection of aerial photographs and the Lancashire HER have established 17 possible locations within the Whitewell study area. More intensive walkover survey will be used to map and record potential sites on a more systematic basis and also to record the locations of post-medieval limestone extraction. Brook et. al. (1994, 260-2) record two further systems in the locality, Dinkling Green Mine Cave and Whitewell Pot, which are highly unlikely to have been open in prehistory. All the other sites will be investigated through at least sample excavation to characterise the surviving archaeology and its distribution. A small (c. 2 m wide and 1 m high) west-facing rock arch currently visible in the tributary stream valley immediately to the south of New Laund Farm (figure 1). 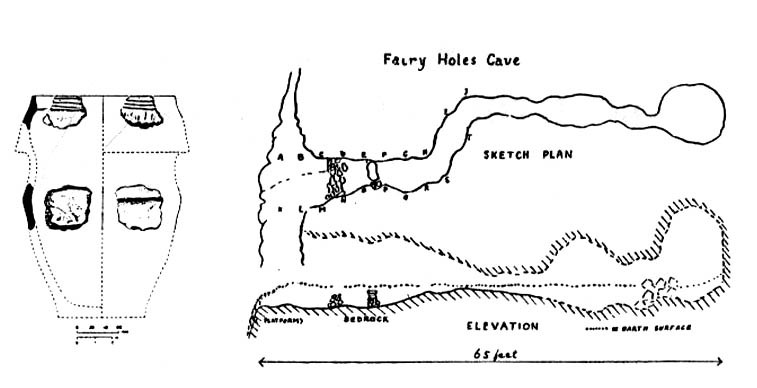 Fairy Hole Cave – excavated in 1946 (Musson 1947). All the surviving deposits appear to have been removed at this date and the only recorded finds were a few chert blades, sherds of pottery identified as Early Bronze Age urn and animal bones (Musson 1947, 166). A medium sized (c. 8 m long) east facing rock shelter above the track to Tunstall Ing Farm. A complex of swallow holes which may have a buried outlet at a nearby limestone outcrop (figure 2). 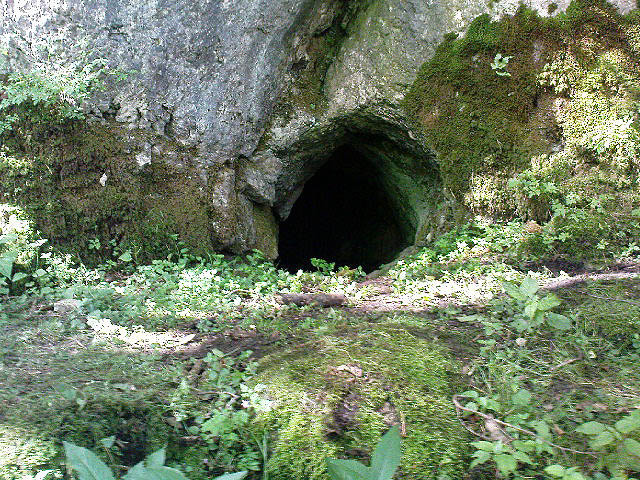 Whitmore Pot – a shakehole leading into 27 m long cave system (Brook et. al. 1994, 262) and mapped caves and pot holes at the southern edge of Whitmore Knot. At least some of these may have been truncated by historical limestone extraction. Brook, D., Griffiths, J., Long, M. and Ryder, P. 1994. Northern Caves: Volume 3 – the Three Counties System and the North-West. Skipton: Dalesman Publishing. Musson, R.C. 1947. A Bronze Age cave site in the Little Bolland area of Lancashire. Transactions of the Lancashire and Cheshire Antiquarian Society 59, 161-70. Dixon, J. 1992. 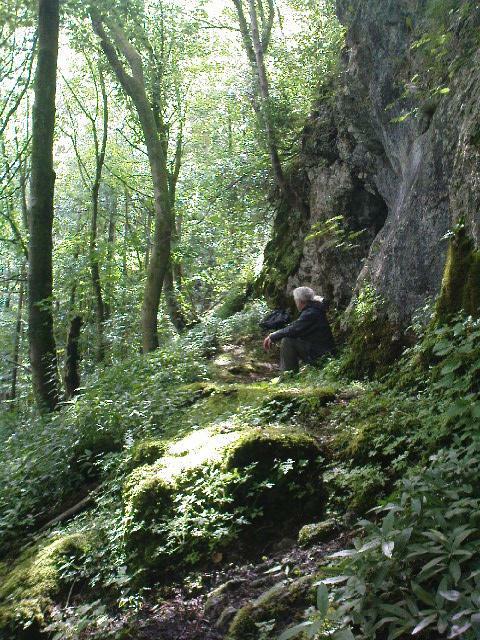 Journeys Through Brigantia: Volume 8 – The Forest of Bowland: Aussteiger Publications. Common courtesey, human understanding, common, decency make us human, along with sharing good food, shelter, et.al..
Simon Armitage is a good human – like most of us are, What he does through his work as a poet is for the betterment of us all – He is a decent guy – a good poet in my, & many others, opinion … & by what he brought to public attention was human, kind, right, … a good act … (wish that I could contribute 1% as much) . Gavin Edwards is a good human too ( & leading archaeologist in his field of research) … one of the good guys, well respected & well deserving of that respect … take a look at his work … well deserved respect in my opinion, … for 1st class public service. .. Thanks Gavin … from not only me but the many who value your service to human evolution …. Paul Bennett is also a good human being – one of the best – let us ALL wish him a good future, given Current understandable failings that we all have – no mistaking that ! (time & time again in mine & many others cases), Paul WILL go on to prosper & his work WILL lead to the benefit of humanity …( trust me Paul – old grey-head that I am! ).